No withdraw, no win, no handshake. The ancient Greek Olympiad, the origin of today’s Olympic Games, was held in honor of Zeus. The games were used as a political tool between rival city-states. It was all about victory and the assertion of dominance. The inception of the Olympiad dates back to nearly nine hundred years before the moon god, Allah, whispered his special message into humanity through the angel Gabriel. So, it is not odd that upon completion of the August 12 judo match of the Rio Olympics between Egyptian competitor, Islam el-Shehaby, and Israeli champion, Or Sasson, that the devout Salafi publicly observed his god by refusing, according to Quranic commandment, to shake the extended winning hand of Sasson, the Jew. Deference to Allah is why Egyptian Copts are barred (unofficially) from Egypt’s Olympic training camps at an age when children are singled out for athletic talent. indicating Christianity will shut any candidate out. Shehaby was internationally ranked very high, at 25, in his weight class. As Egypt’s state champion, Salafi Shehaby’s chances were very good for victory; predictions were made that Islam would dominate. The Egyptian Olympic Authority knew it risked the dreaded possibility that Shehaby could face an Israeli champion. Sure enough the 32nd round of the judo matches determined this to be when the draw brought Sasson, ranked at 5, to face Shehaby. Cries of protest from the devout of Egypt (and other Islamic countries) for Shehaby to withdraw were deafening. This actually gave the 34-year old Salafi judoka a choice. Reminded of his duty to the Charter and his country, he could stay on track. Otherwise, withdraw from the contest and abide by the religious dictates of his conscience (embodied in the disapproval of fellow believers). 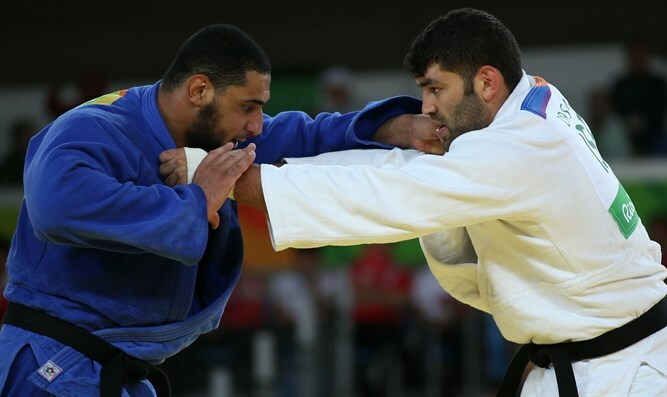 Shehaby, no doubt, had in mind fellow athlete, Ramadan Darwish, who overpowered his Israeli competition in the 2012 Dusseldorf quarterfinals of the German judo games delivering Egypt the Bronze medal. Darwish brought a double honor to Allah when he disregarded the after-match handshake in submission to the laws of his religious doctrine. However, what Shehaby didn’t know choosing to go forward was that two days hence he would honor Allah in front of the world only by half his former teammate – losing the combat and likewise refusing the sportsman’s handshake. The final push for his decision to engage came from the president of the Egyptian Olympic Committee, Hisham Kattab, who confirmed that no one can force Shehaby to withdraw and shatter his hopes of an Olympic competition just because he happens to face an Israeli player. He went on to wish Shehaby a win and the achievement of an Olympic medal. On the day of the match, reporters described Shehaby looking haggard, stepping onto the mat with his eyes darting and knees quivering. Bigotry is not easy. Just the thought of proximity is unnerving and, in this case, weakened resolve. Like Nasser’s ‘67 five-day defeat, in five minutes it was over for Shehaby. The Egyptian president returned from the world stage to apologize to the Egyptian people as Shehaby needs to do now. Egyptian government authorities and their Olympic committee publicly condemned Shehaby’s behavior calling the player back home. Meanwhile, Shehaby’s success resides in his contribution to the expansion of Islamic ideology. Christian Coptic participation in Egypt’s Olympics is tokenism, if and when we see it. In their formative years, Egypt’s Christian children know they haven’t a shot at striving for the pinnacle of athletics and, for that matter, government, academics, politics or the military. Only just recently are there a handful of elected Christians to the Egyptian parliament. However, this will not yet lead to the reversal of institutionalized second-class status for minority religions.